sky was my first dog and was got as a pet to start of with. when she was about 1 I was introduced to to dog protection, and she took to it like a duck to water. she is a medium drive dog but hard as nails. she like nothing more than the sleeve work and a good nap. 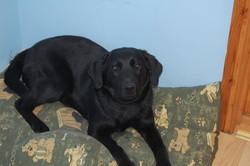 she has produced a 1 litter of 8 pup all of witch have gone to great home and have made very good pets. With her cam temperament and a hip score of 11 I am confident her pups will make there new family happy for years to come. Claire is my shooting parter, and good family pet. Out side she is full of beans in the house love relaxing by the fire taking all the attention my son can give here, she also gets on well with the cats. 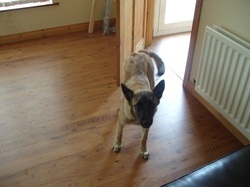 jazz is a Belgian Malinois and from 1 of the best breeders in englend, how breeds dogs for the police and army. she is a live wire and not a dog for everone sharp to respond to commands fast and agile and a get protection dog. she is also a get mother as she has just prduced a her first strong litter with no runts every one is a champion in the weighting .